Posted on Fri, Mar 23, 2012 : 5:30 a.m.
Belgian ales are known for superior quality and exquisite world class taste. Description: Poured into native glassware, the hue is sunny, opaque orange with strands of effervescent bubbles supporting a billowing head. The bouquet is amazing, waves of tart citrus slightly muted by grassy yeast, ground pepper and a subtle hint of brett (often referred to as funk.) Initial intake smacks of fresh citrus held in check with complex traces of clove, coriander and white pepper. The malt foundation offers depth and balance, while the citrusy hops morph into a refreshing crisp tingle on the back of the palate. Astonishing! Conclusion: Not worth leaving the spouse over but could make a strong argument. The serving ritual itself reads like a seduction: a vessel carefully retrieved from a chilled cellar held supportively not to disturb the sediment. The tissue wrapping is parted with care to reveal a shapely bottle. The wire cage unhooked releases the cork with a sigh. Frothy ale flows lovingly into elegant glassware shaped to hold the subtle bouquet and beads of seductive flavor. Anticipation surrenders to the touch of chilled glass, and inevitably the act of consumption — a world class affair indeed. My affection for Belgian ale started in in 2005 when I picked up the July issue of Men’s Journal. I typically don’t read this sort but the cover claimed, “The 8 Best Beers on Earth - Bar None!” Thumbing through the article I was introduced to La Chouffe, Rochefort, and Fantome for the very first time. 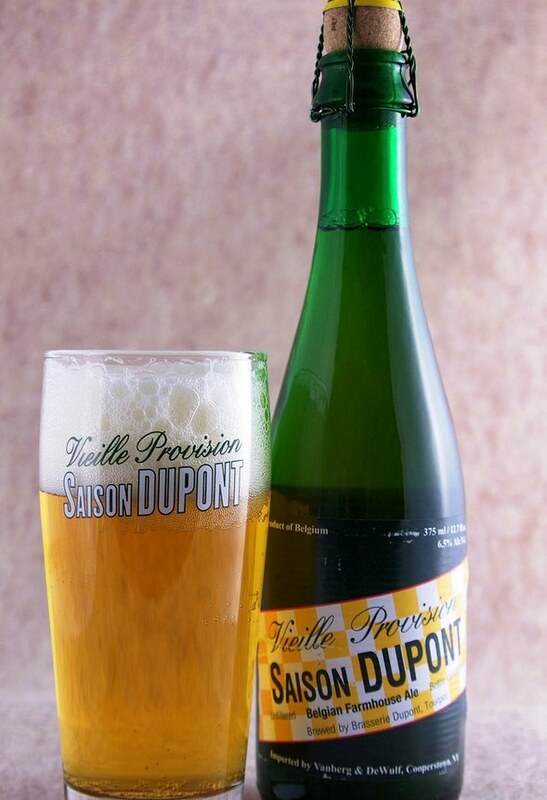 Saison Dupont was voted best in show, described as “earthy, herbal, and impossibly delicious”. Intrigued I quickly concluded the world of Belgian beer deserved further attention, and I would start at the top. Saison, meaning "season" in French, is perhaps one of the most interesting and diverse beer styles in existence. The style does not have the pedigree of a Porter or Bock but rather humble beginnings in Southern Belgium. Saisons are complex, well balanced and refreshing, which makes a perfect summer companion. Nate Parsons is a contributor to AnnArbor.com and can be reached at modevin@yahoo.com. Sun, Mar 25, 2012 : 9:26 p.m. Wed, Mar 28, 2012 : 4:09 a.m.
Saison Dupont is a great beer, and I take no issue with the review itself -- it's solid. It just struck me as odd that there was no mention of JP for a sense of local comparison (in the same way that you mention La Chouffe, Rochefort, and Fantome as points of general comparison). I'd love to see you do a piece on your favorite gueuze! Seriously, that would be great. Cheers indeed! Fri, Mar 23, 2012 : 2:20 p.m.
For those who prefer smaller bottles, Morgan &amp; York typically carries the 330ml 4-packs of Saison Dupont for a little over $20. Also, I'm not sure why the author, who claims to have a long-standing affection for Belgian-style ales, makes no mention of Dexter's Jolly Pumpkin -- an excellent opportunity for a local tie-in. At their A2 pub, they currently have their iO Saison, Bam Biere, E.S. Bam, and Bam Noire on tap, all of which fall within the general category of saison/farmhouse ale. Fri, Mar 23, 2012 : 10:26 p.m.
Mr. Parsons doesn't seem to have much interest in local brewing. His columns are notable for the lack of references to Michigan products even if they've won national awards, as Jolly Pumpkin's Belgian-style beers have. I wonder if he doesn't live here, or sells his columns outside Michigan or something.